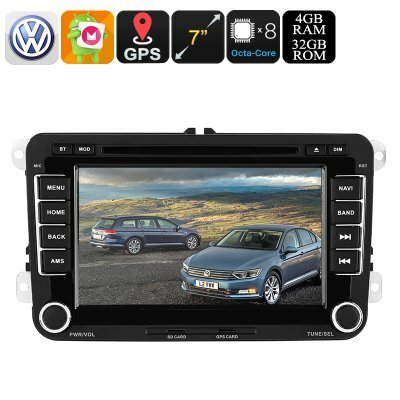 Successfully Added 2 DIN Car DVD Player - For Volkswagen Passat, 7 Inch HD Display, Region Free DVD, Bluetooth, WiFi, 3G, CAN BUS, GPS, Android 8.0 to your Shopping Cart. This 7-Inch car DVD player for your Volkswagen Passat allows your passengers to enjoy media straight from the dashboard. From now on, you’ll be able to entertain your kids and passengers during those never-ending car trips to your upcoming holiday destination. Thanks to the Android 8.0 operating system, this 2 DIN car stereo allows you to enjoy movies, games, and Applications. With access to the Play Store, this car accessory brings hours worth of fun and entertainment into your car. From now on, not a single moment of boredom will ever enter your car again. Its region free DVD player supports all the discs out there. Thanks to this, you’ll be able to buy new DVDs abroad without needing to worry about whether your car media player can read them. Besides watching movies and playing games, this Android media player naturally also supports regular AM/FM radio frequencies. Thanks to this, your car stereo lets you enjoy the latest songs and your favorite talk shows while driving your vehicle. Additionally, it brings along Bluetooth connectivity that lets you sync your 2 DIN media player with the music library on your smartphone or tablet. Through its four 45W speakers, it will treat you with an outstanding audio experience. Behind its 7-Inch HD display, this car DVD player packs a powerful Octa-Core processor and 4GB RAM. Together, this hardware lets you handle all basic Android software applications. The media player even supports WiFi and 3G connectivity through a dongle (not included). This allows you to browse the web anywhere you’re at. Download apps, stream movies, or make online calls – nothing is too much for this car media player. Additionally, it comes with a 20-channel GPS navigation system that will lead you the way to your upcoming destinations. While your passengers are enjoying all its media features, you will be able to effortlessly drive your car without ever needing to worry about getting lost again. This car DVD player comes with a 12 months warranty, brought to you by the leader in electronic devices as well as wholesale electronic gadgets..